Life is all about L-I-V-I-N. In our world, that means seeking out as many unforgettable food adventures as possible. The Queen City has got you covered with everything from old-school classics to stick-to-your-ribs street food and elegant eats. Consider this your edible Charlotte bucket list. 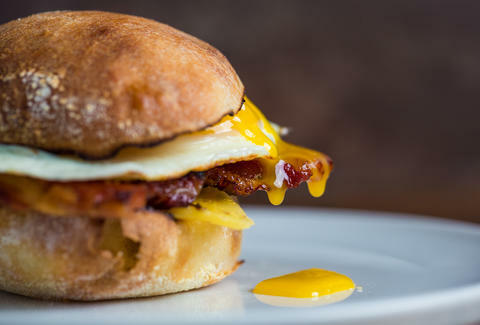 When eating the BEC at littleSpoon, the yolk shines just a little more golden and runs down the side of the bun like your favorite slow jam. There’s white cheddar and bacon on backup. You can’t call yourself a Charlottean until you’ve eaten Price’s Chicken Coop. This Southern fried take-out-only institution dishes out crispy, well-seasoned boxes of fried chicken with cole slaw, hush puppies, and a pillow-soft roll. The line moves fast, but you better have cash. The ingredients are that of the classic recipe: chicken livers, shallots, garlic, brandy, and cultured butter. 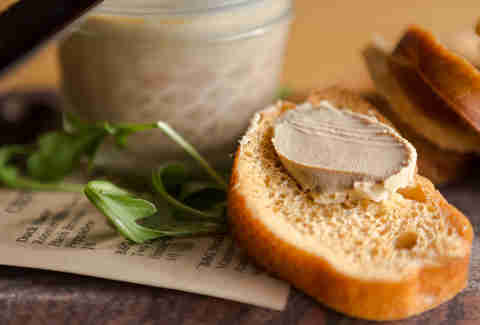 Somehow Chef Ben Philpott manages to finesse offal into a creamy, whipped delicacy that surpasses all others in town. Mert’s is famous for its soul food, and at the heart of the restaurant are the salmon cakes. Two salmon patties blended with Cajun trinity and spices, then grilled on the flat top. Nab an order of cornbread and a sweet tea, and you just might pass for a local. 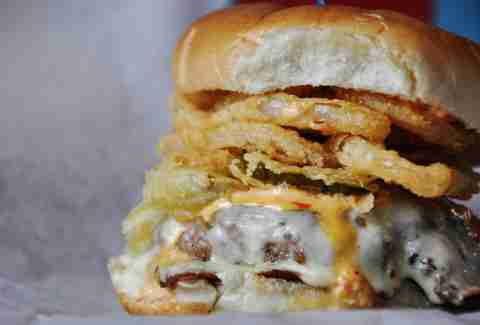 I don’t always eat ranch dressing, but when I do, it’s on the White Trash burger at Pinky’s Westside -- a burger crowned with provolone cheese, fried pickles, and onion rings. Fun fact: these are the fried pickles of Penguin Drive-In legend, and the man who created them is now the chef here. The infamous calamari is tradition at Passion8 because the customers demand it so. Perfectly crisp calamari rings are tossed in a jalapeño and honey citrus butter for a sweet, irresistible heat. Consider this the consummate hangover helper courtesy of the Doan family. 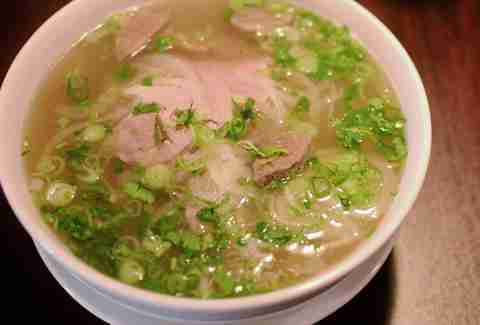 Serving a Southern Vietnamese-style pho, Doan’s uses fresh ingredients and a long-simmered beef broth scented with herbs, warming spices with tissue-paper thin slices of steak. Brothers Branko and Djordje Avramovic honor their Serbian heritage and use their grandmother’s recipes to delight and comfort their customers. Go for the beef burek, ground beef, and onions wrapped inside house-made filo dough. The torta Cubano will give you the finest food baby of your life. Ham, carne asada, and hot dogs grilled a la plancha get dressed with pickled jalapeños, lettuce, avocado, tomato, and crema, and the bread is slathered with refried beans on one end and crimson chorizo on the other. Order the Life Changer, a steamed hot dog laid atop a bun married by the griddle with a slice of melted cheese. Spicy mustard, taco sauce, white onions, pickled jalapeños, and chili (duh!) finishes the dog, leaving you to contemplate the meaning of your life BHD (that is, before hot dog). 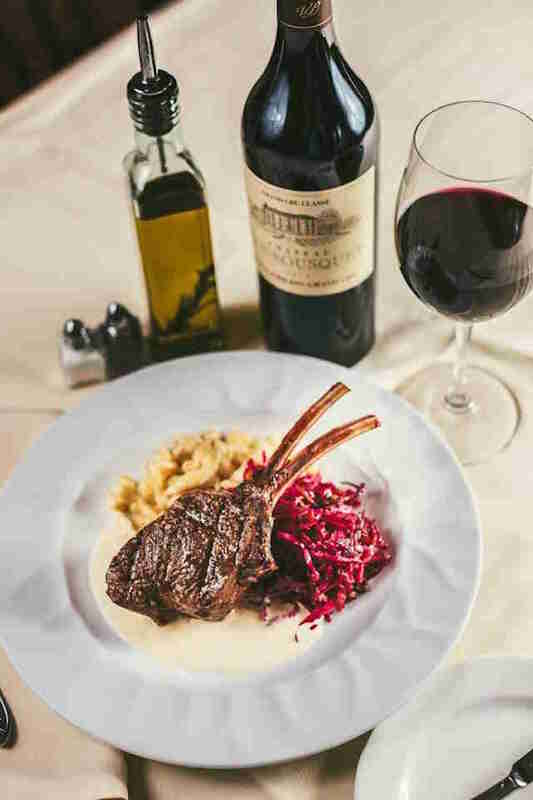 The showstopper on the menu at the Fig Tree is the elk chop -- 14oz of a double-cut elk chop with horseradish spaetzle, braised red cabbage with smoky bacon, and a classic Boursin-Dijon sauce. The arepa at Sabor is the most ample hand-held meal you can get for five dollars. A warm, griddled maize cake is split open and stuffed silly with shredded chicken, tomato, onion, cheese, and their tangy-sweet rosada sauce. The Brooks twins have been doing things the same way their daddy did since this tiny grease-hut opened over 40 years ago. Three dollars and 50 cents will take you “all the way” -- one beef burger smashed on the flat top, with cheese, Brooks’ chili (a family recipe), yellow mustard, and diced onions. Some might go for the salted caramel brownie here, but the decadence lies between flaky layers of puff pastry stacked high with alternating layers of thick pastry cream. Brave the dismal parking lot and emerge triumphant with Le’s #6. It’s all about the French baguette with the perfect chew, dolled up with grilled pork, pickled carrots, and daikon, cilantro, and mouth numbing jalapeños. Though Kindred’s menu is a rotating carousel of seasonal delights, the fried oysters have stuck in the short time since they opened. Lightly battered and fried crispy, the tender oyster is paired with dill yogurt and droplets of Calabrian chili oil. 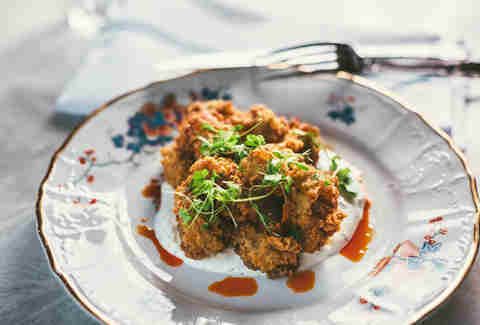 Cozy up with a pint inside this comfortable Irish-style pub and order the cornmeal dusted bites of pickled okra, fried crispy and served with a cooling buttermilk-chive dressing. Nutty, grilled cauliflower takes a bath in TIN Kitchen’s house-made Buffalo sauce, which turns this brassica into your next food craving. It comes wrapped in a corn tortilla with celery root slaw and a sprinkling of blue cheese crumbles, but can also be ordered alone, as a side. What’s more comforting than a perfectly seasoned, tender chicken, spit-roasted and flame-kissed? Juicy spit-fire roasted chicken with a side of soul soothing mac and cheese. 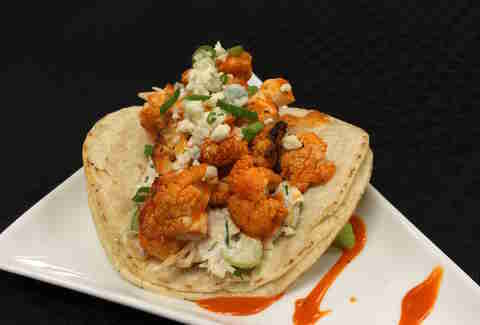 Part of what makes this dish a palate-awakening flavor bomb is the two-fold treatment of the cauliflower. Florets of cauliflower are first spiced with cinnamon, coriander, cumin, clove, and fresh green pepper before being fried crispy and tossed with a clingy garlic scallion glaze with hints of soy and chili. 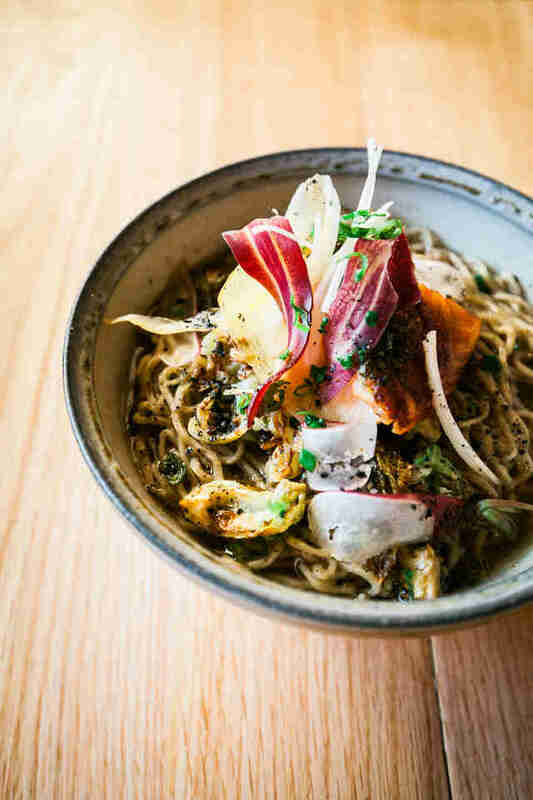 A welcome diversion from the tonkatsu darling of the ramen world, Futo Buta concocts a not-too-spicy kimchi broth with smoked salmon and livens it up with fresh mint, cabbage, carrot, and black sesame. House-made alkaline noodles for the win. Childhood favorite meets backyard cookout. Pulled pork, macaroni and cheese, and savory bourbon onions get tucked into a gooey grilled cheese sandwich for this signature dish from one of Charlotte’s most popular food trucks. Fried garlic and shallots add an extra element to this flash-baked sushi roll filled with tuna, avocado, and lump crab, dotted with a fiery aioli. It’s tough to pick just one small plate here, but the standout is the Korean beef, medium rare and tender atop toothy rice with scallion kimchi. Go ahead and order three of them to start. The only thing more curious than how good this cupcake tastes is the man who makes it. Andy Jackson, the man with the fu manchu, and a penchant for sweets fills a cupcake with homemade caramel and frosts it with salted caramel icing sprinkled with salty bits of bacon. Stand in line (have cash) and wait your turn to grab a styrofoam container filled with savory pork carnitas and a pound of warm, handmade tortillas. Chef Chris Coleman replicates his Maw Maw’s recipe with aplomb. 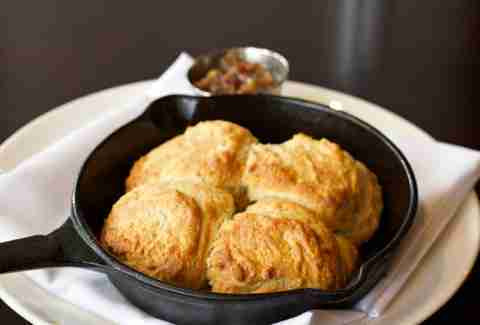 Buttermilk laden biscuits are baked inside a cast-iron skillet and served with Benton’s bacon jam -- the smoky, savory, sweet and tangy condiment that’s good enough to drink. Also called bánh xèo, the Vietnamese yellow pancake, is a savory crepe made of rice flour and turmeric, which is the reason for its signature yellow hue. Saigon Palace serves a fluffy and imposing masterpiece with traditional sides -- bean sprouts, lettuce, nuoc mam cham, and the Vietnamese herb trinity (cilantro, basil, mint). Eat it with your hands. The technical term here is the #28. Vermicelli noodles are piled senseless with grilled shrimp, pork belly, beef, chicken, and onions topped with a bouquet of herbs and the all-important nuoc cham which coerces the noodles into slurping territory. Chef Rocco Whalen and team may be perched twenty-one floors above Uptown Charlotte, but that doesn’t mean he’s above dishing out a plate of cheesy “nachos” to the cosmopolitan crowd. 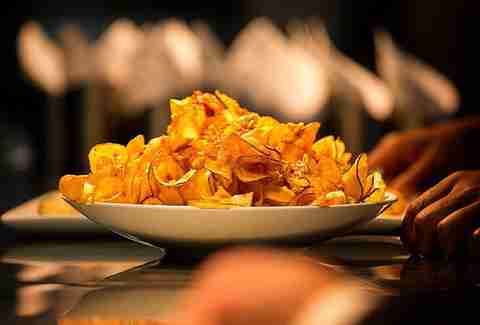 A ribbon of house-made potato chips, a la county fair, arrive covered in pimento cheese fondue (made with Olde Mecklenburg Brewery’s ‘Copper’ brew) and applewood bacon. Airy clouds of parmesan gnocchi swim with braised veal in most comforting, well-loved red wine and veal sauce. A winter cure that feels as if it were made by a beloved nonna. Little canoe-shaped shells of hand-rolled ricotta cavatelli are the perfect vessel to catch the synchronized flavors of red pepper, fennel sausage, onions, fennel, and tomato-laced brodo. 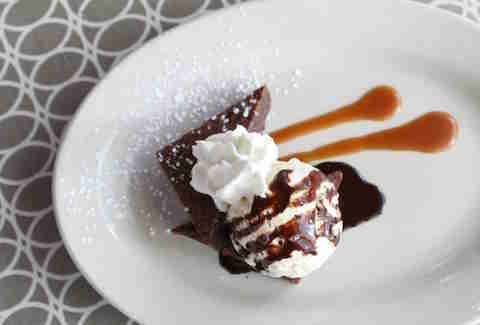 The brownie à la mode is the stuff of childhood summers, and it’s been served at 300 East since it first opened in 1986. The brownie is equal parts cake and fudge, served warm with salted caramel, honey chocolate sauce, and vanilla bean ice cream. Hand-shredded chicken comes covered in a thick, warmly spiced mole with notes of cinnamon, chocolate, and ancho chile. Put those fresh tortillas to good use and leave not a drop. This isn’t as much dinner as it is meat candy. Fat cubes of caramelized brisket ends are tossed in a house-made Fat Tire BBQ sauce. Smoky, sweet mother of God. 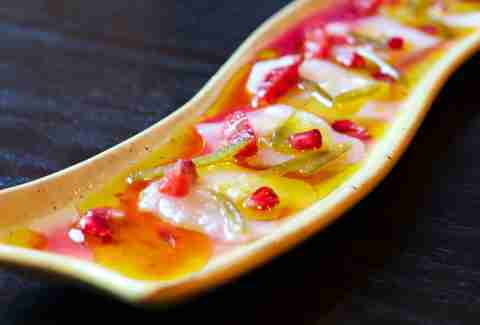 Raw, sweet diver scallops arrive thinly sliced with blood oranges and pops of pomegranate seeds on this highly appealing appetizer. The whole thing is doused in good olive oil and sprinkled with flaked salt. A generous heap of organic lettuce is topped with avocado, pico de gallo, tomatoes, cashew sour cream, and a walnut-almond crumble that’ll make you forget that it’s not taco meat. Double up on Luna’s homemade hot sauce. Eggplant is smoked over charcoals and then blended with tahini and lemon juice and served with Kabab-Je’s fresh pita -- airy, light, and baked in their impressive wood-fired oven. Earl’s upped the lunchtime game when they introduce the #6 to the people. 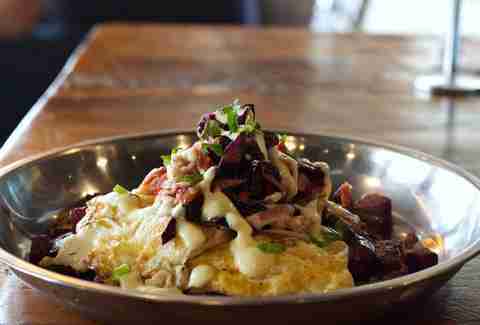 Succulent duck confit goes into a caramelized beet hash with seven spice, tangy slaw, and then gets blessed with two farm eggs and an aioli drizzle -- all in one big mountainous bowl for your pleasure. Moulard duck prepared two ways: a slow-poached breast pan roasted to order accompanies duck leg confit wrapped in feuille de brick finished with a sophisticated l’orange sauce and the prettiest baby vegetables you ever did see. If you have $2 to spare, head to the food court inside the Super G International Food Mart and pay a visit to the Honey Bun for a sweet, pillow-soft red bean paste bun (dou sha bao). 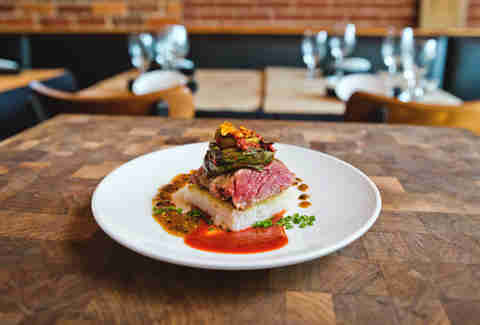 Handmade and served warm, the trip down Independence Blvd is a small price to pay. A dish as classic as the restaurant itself, which has been open for 22 years. 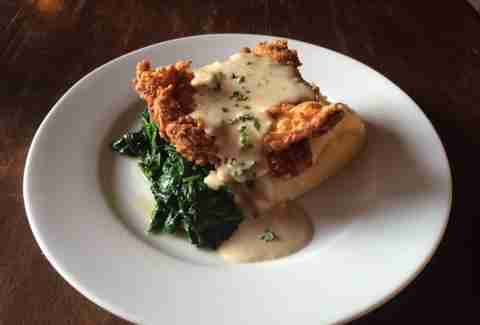 Buttermilk-fried chicken breast anointed with black pepper shallot gravy, served yukon gold mashed potatoes and sautéed spinach. Beer and butter are responsible for the glorious cajun shrimp dish and its tasty sauce. The only thing you’re responsible for is having enough bread to sop it all up. Late night eats don’t get any better than a slice of pizza bigger than your head. Seriously, this is a two-plate slice that you have to see to believe. This is the place to get a New York-style bagel in Charlotte. 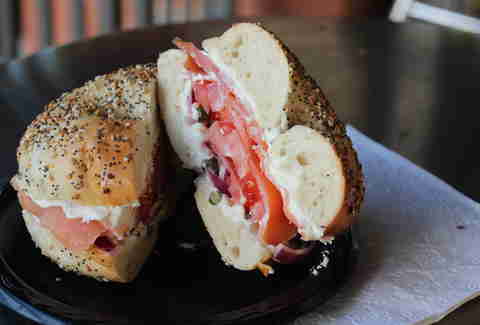 Specifically, the everything bagel with lox and cream cheese and all of the things -- capers, red onions, and tomatoes. Lacquered pork belly and a ruby cube of watermelon arrive on a palm-sized tortilla ready for two-bite consumption. Swanky cocktail and fashionable beats to finish. The croissant at Sunflour Bakery is an homage to the magical persuasions of butter and flour. 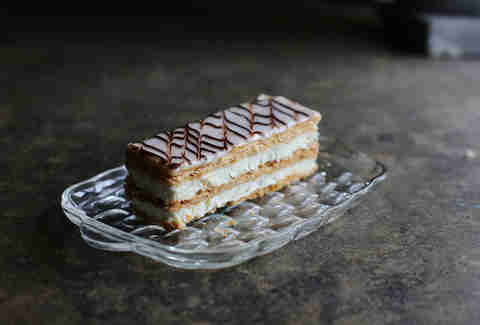 A shatteringly flaky outside gives way to the soft tender insides of this gigantic and perfect pastry. 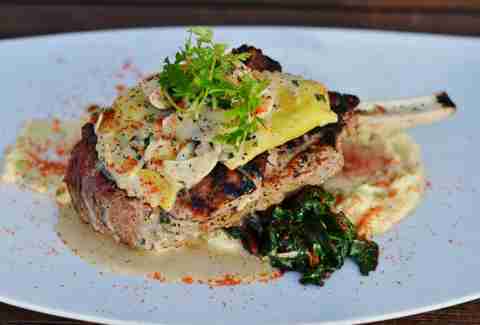 Vivace’s signature dish is a rich creation of a thick cut wood-grilled pork chop served atop mascarpone polenta with swiss chard, lobster, and spinach ravioli, rosemary, and vincotto. Bring your appetite. Copper’s version of traditional comfort is a sunset-hued blend of hand-ground masala spice, ginger, tomatoes, and onion into what some refer to as “the love sauce” and paired with marinated chicken tikka fired in a tandoor oven. Feather light pockets of naan are a must. Grilled cheese at its savory best. Orrman’s uses thick slices of focaccia and stacks it with locally made smoked mozzarella, translucent slices of salty prosciutto, and marinated tomatoes, which is then panini-pressed into blessed union. Keia Mastrianni is a freelance writer with an unapologetic appetite and insatiable curiosity. Follow her on Twitter and Instagram @keiaishungry.